Crossing the threshold of certain hotels is like entering into a world of fairy tales and one-of –a-kind experiences. 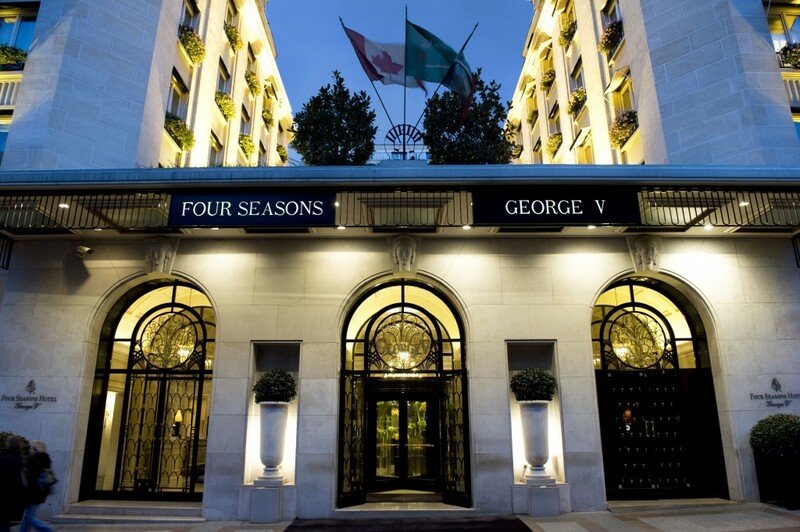 The Four Season George V in Paris, situated at the heart of the Paris Golden Triangle designer shopping district, is, without a doubt, telltale proof. Originally opened in 1928 in honor of George V, this historic art deco hotel is all about traditional comfort à la française with its Classical French furnishings (Louis XVI, Napoleon I). 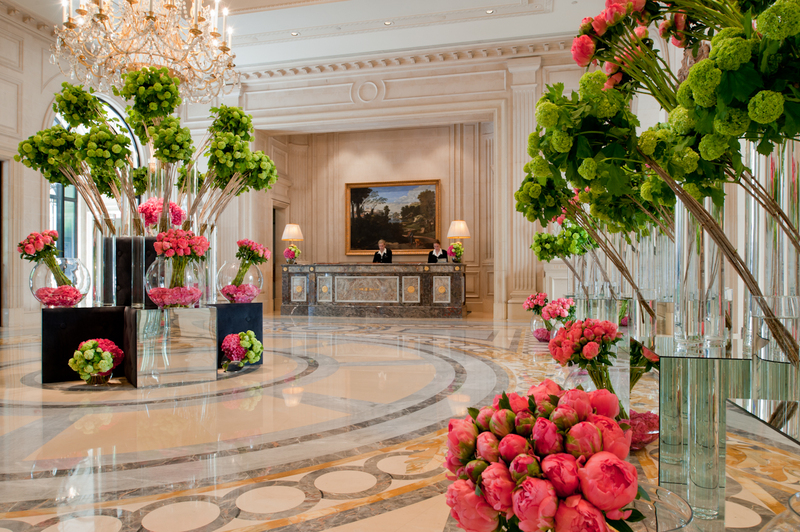 But if there is one thing that stands out above all the rest it is the breathtaking floral display (9,000 flowers are delivered from the Netherlands weekly) which has become a fundamental part of the Four Seasons Hotel setting and not just a mere backdrop. 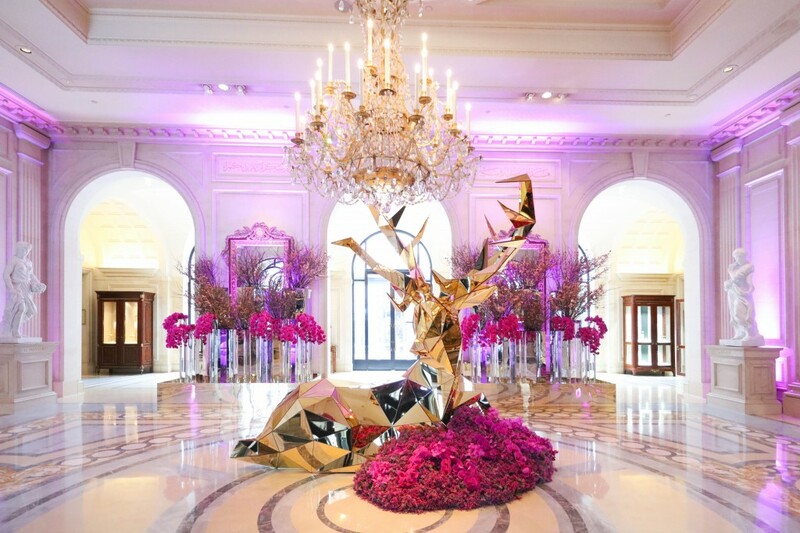 Behind this high end floral design we find Jeff Leatham, the hotel’s acclaimed Artistic Director who has been creating a sensation with his floral designs for over 16 years. 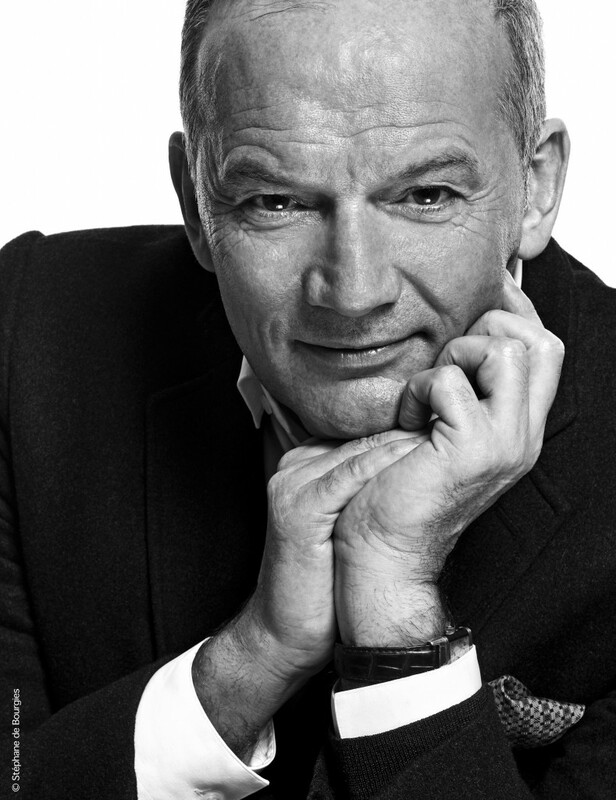 Jeff was Awarded the prestigious “Knighthood” / “Chevalier de L’Order des Arts et Letters” in 2014, the French Government´s Highest Honor for Artists whom have made a significant contribution to French culture. Oprah Winfrey, Kylie Minogue or Tina Turner are just a few of his clients, and his famous Christmas displays are already this American´s legacy in the great City of Light. We will begin with dining pleasures and the 3-Michelin star restaurant Le Cinq, an exquisite dining room boasting beautiful views of the courtyard. Christian Le Squer, named chef of the year by his peers in 2016 draws up a signature menu based on classic French culinary techniques. Do you want to learn how to shake the famous E«V»A, a very special cocktail created for actress Eva Longoria or even better drink it ? Guests of Four Seasons Hotel George V have the chance to take a cocktail course with the head barman, Grégory Hazac. The one-hour course begins with a demonstration, followed by a hands-on shaker session and tasting. 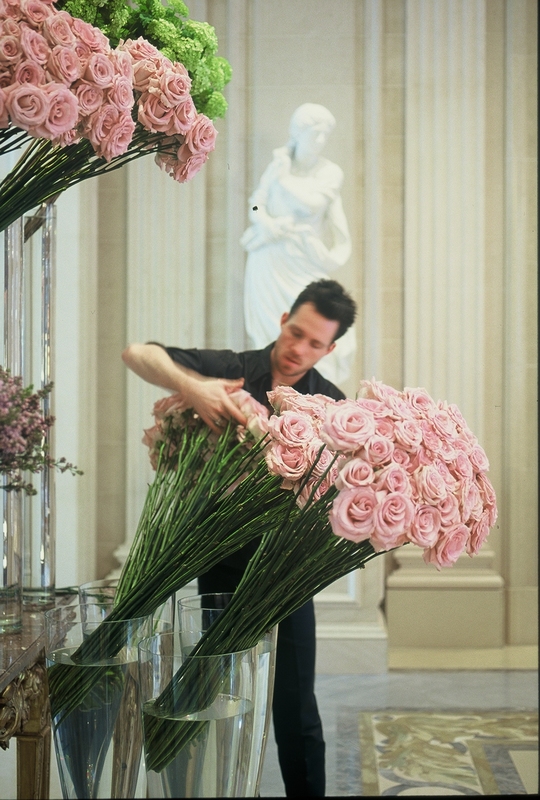 Ready to create your own floral bouquet and meet one of the best floral artists in the world? 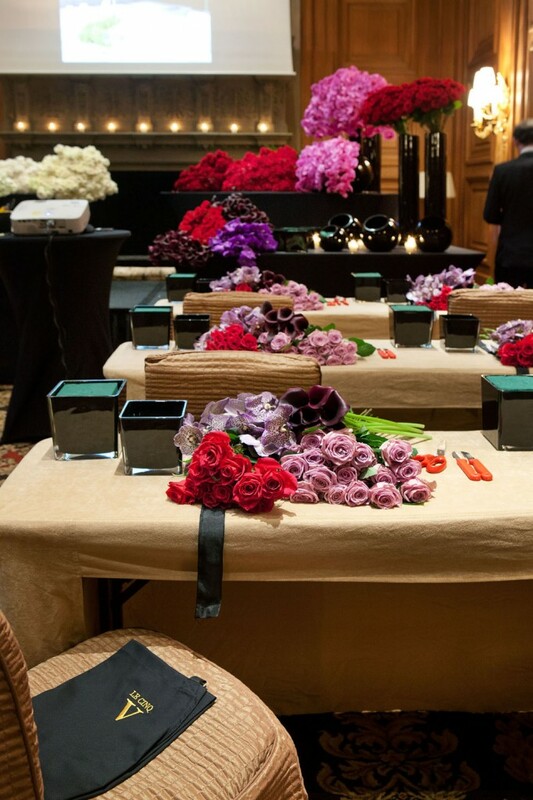 Guests are also able to participate in a floral arrangement class hosted by Jeff Leatham. The class is a rare occasion to meet this remarkable artist and to witness the combination of his love for flowers and his passion for design. Since the George V is located just aside the Paris Champs-Elysées avenue, it is quite a hard task to mention here all the interesting boutiques you can enjoy easily since they are all located just a few steps after going out of the Four Seasons George V. The most famous ones are Louis Vuitton, Hermes, Armani, Bvlgari with impressive flagship stores that the George V concierges know perfectly well. They can eventually set up special VIP visits thanks to their relations with each of those boutiques managers. Newness 2017 : The new Rolex boutique just in front of the George V building located at 48 rue Pierre Charron. The manager Mrs Nathalie Nahmias is absolutely charming and presents all the last newnesses of the Rolex house in avant-première thanks to the large network of the Arije distributor. Do not hesitate to click on our TELL US WHAT YOU NEED BUTTON here below and we will do our best to help you with minutes.